Yes it is about 400 miles. The roads are easy and I know of one person that pulls a trailer. This is a 2 day trip that goes up to the rim over Four Peaks and back down to Roosevelt Lake and then back up the other side to the rim to out of car camp and howl at the moon. Sunday the travel to Strawberry or breakfast and the head down into camp verde and back up to come back into Phoenix through Seven Springs and Cave creek rd. This is the intended route if there is no major issues with the cars. There are lots of jump off spots if you only want to come out for the day. Most of the roads are dirt but we must use some streets to get to another part of the run so Street legal vehicles are a must. 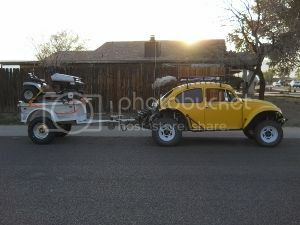 Four peaks rd UTV loading corral departing at 08:00am 33.666414, -111.509164 Don't be Late. You will be left behind and have to catch up to the group. After this trip I will update the map locations and our groups info to the spots with google pins for ease of use. Here is the gps coordinates given to me by the AVC. If you have a UHF radio we will be on Ch 3 because so of the newer radios are having trouble with the Privacy codes. Anyone know if the strawberry lodge is still open or is there a place to get Breakfast??? Does anyone know if Fossil Creek rd is open yet??? CHECK POINT #1 Chamberlain Trail (34.150954, -110.916640) if we go to Haigler Creek we save about 3hrs and if we can camp there if needed then to 260. or take rt 512 to 260. WE ARE BACK IN PINES!! stop in Camp Verde for gas, ice, food, ect. Re group and Photo shoot at Seven Springs ..